Toss together the oranges, fennel and onion. In a jar or dressing container, shake together the dressing ingredients. 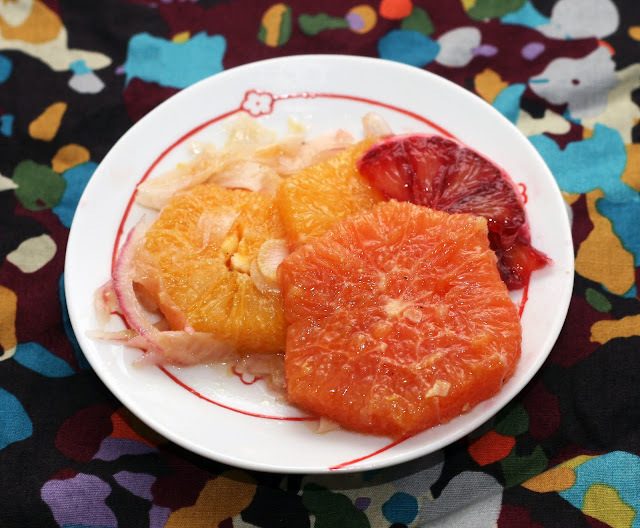 *I squeezed the juice from the flesh left on the skin from peeling the oranges with a knife. This is one of my favorite winter salads to date. It is easy to make but very bright and fresh tasting. I loved how the fennel pollen tied in with the shaved fennel and contrasted with the red onion. 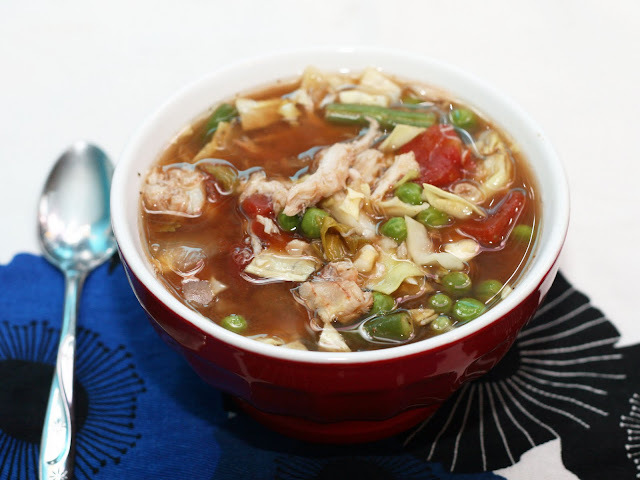 Place the ingredients from group #1 in a 6 quart slow cooker. Cook on low for 8-10 hours. Add the ingredients from group #2. Stir. Continue to cook 1-2 additional hours. January is National Soup Month! Can you believe that I have lived in Baltimore all my life and until very recently, I hadn't made Maryland Crab Soup? I've had it plenty of course but never have tried to make it myself. Traditionally it is simmered on the stove-top (or occasionally, outside on a burner) but I thought I'd try my hand at a slow cooker version. Honestly, I liked it better than the stove-top version I made first and have had in the past. It somehow tasted fresher and the flavors were deeper. The fact that it was much easier to make was just the icing on the cake. Or the lima bean in the soup so to speak. In a large pot or dutch oven, heat the olive oil. Add the vegetables. Saute a few minutes just until the vegetables start to soften. Pour in the broth and add spices. Simmer covered for 20 minutes then remove the lid and simmer until the liquid has reduced a bit and the potatoes and turnips are soft. Using an immersion blender or working in batches using a regular blender, blend the soup until smooth. Whisk in the cheese and horseradish. This is one of those times when I wasn't 100% sure what I threw together would turn out, much less be delicious. Luckily for me (and my husband who had to eat it) it turned out better than I could have imagined. I was going to make a more straightforward leek and potato soup but then I spotted some turnips I forgot I had and tossed them in. Since turnips add a peppery bite to most dishes, I thought I'd highlight that and add other sharp tasting ingredients like horseradish, mustard and very sharp cheddar. The final product wasn't pungent (thank goodness!) but it was rich, hearty and pleasantly robust. 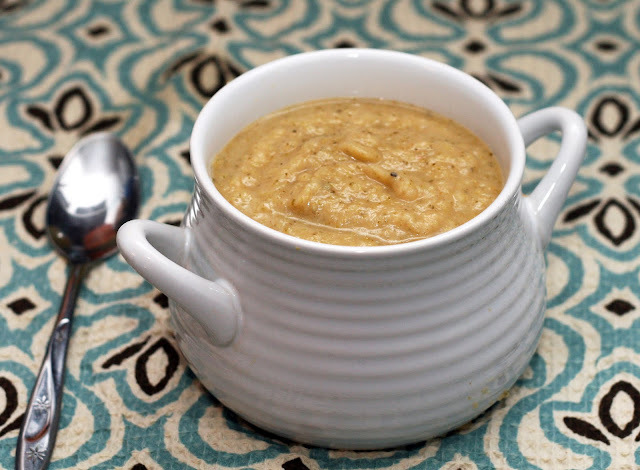 The perfect soup for a cold winter's night. Preheat oven to 375. 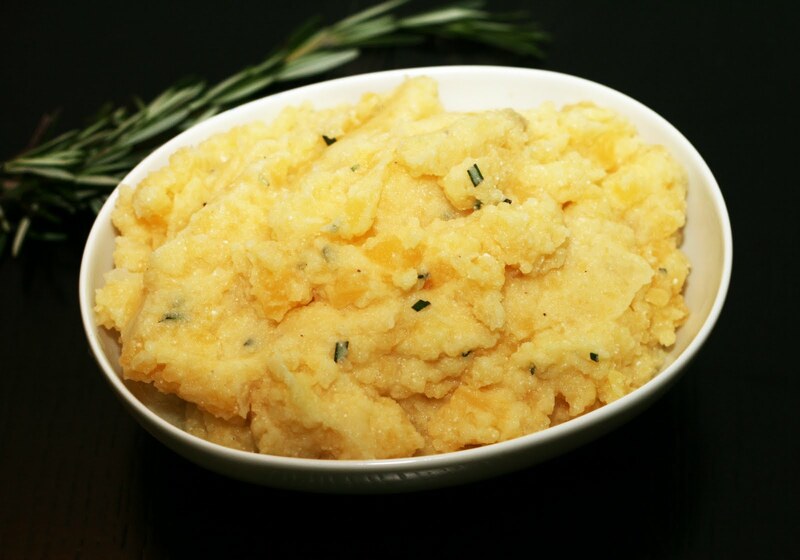 In small bowl, whisk together the mustard, syrup and horseradish until smooth. Rub into all sides of the pork. 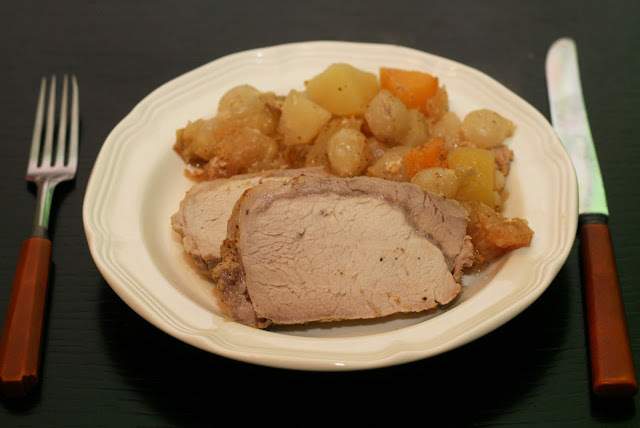 Place the pork in a dutch oven and surround it on all sides with the vegetables and apples. Sprinkle with vinegar, salt and pepper. Cook for 1 1/2 hrs or until fully cooked. While this might be a bit of a homely meal, it is a tasty one! 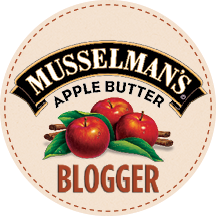 The mustard-hickory syrup** based rub really sealed in the juices and flavored the apples and vegetables as the meal cooked. As the name suggest, the apples nearly melted away! I liked scooping up what I could of the apple and adding it to each bite of pork. So good! And easy! I don't do many one pot meals but this one makes me wonder why not. The only trick is to make sure that your potato and rutabaga are in medium to small sized cubes so they cook evenly and will be fully cooked by the time the pork is done. **One could sub in maple and I think it would be fine but I love the smokiness of the hickory syrup I bought. Place all ingredients in a large (8-10 quart) stock pot. Add water until the pot is nearly filled. After about 3 1/2 hours or until the liquid has reduced about 1/3, strain into a large bowl. Cool immediately by placing the bowl in an ice filled sink. Refrigerate overnight, then skim off any scum that rose to the surface. Package in air tight containers, freezer bags or pressure can to store. I always get a number of comments/emails whenever I call for a seafood stock and since I was making one today, I thought I'd take a minute and write up what I did. Some times I vary the flavors a bit (depending on if I know what dish it is going to go into etc) but this is what I do most often. Shrimp stock adds better flavor to a seafood dish than water or chicken stock. 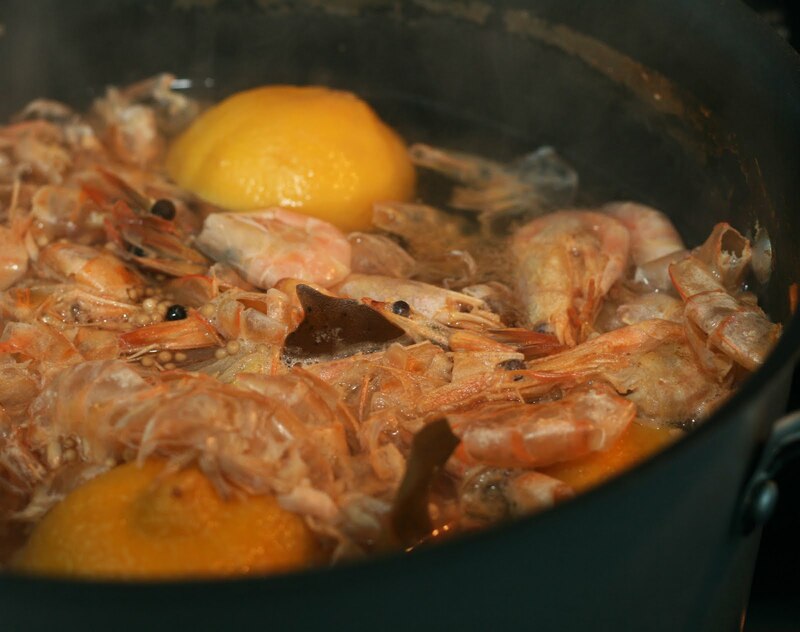 It is a little time consuming but it is hands-off time and you are rewarded with a golden stock that smells richly of shrimp. In a large pot, bring water to a full boil. Add potatoes, swede and onion. Cook until tender the potatoes and swede and easily pierced with a fork. Drain and return to pot. Add butter and sour cream. Mash. I don't think Americans eat enough rutabaga (or as it is called elsewhere, swede. I don't know why not, it adds a peppery flavor to dishes and is a great way to add extra vegetables to things like soups or mashed potatoes without changing the texture. 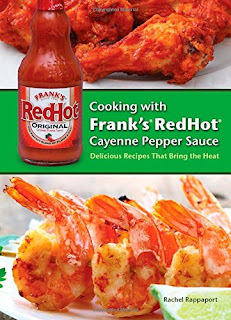 The night before you want to fry the chicken: place the chicken, onion, garlic, 1 1/2 cups buttermilk and 2 tablespoons of hot sauce in a marinating container or resealable bag. Refrigerate overnight. Heat 1 inch of peanut oil in a 14 inch cast iron skillet. Place the Wondra flour in a shallow bowl. Place the flour, paprika, garlic powder, pepper and salt into a second shallow bowl and whisk together. In a third shallow bowl, beat the eggs, hot sauce and buttermilk together. Dip the chicken pieces in the Wondra flour, then the egg mixture then the flour. 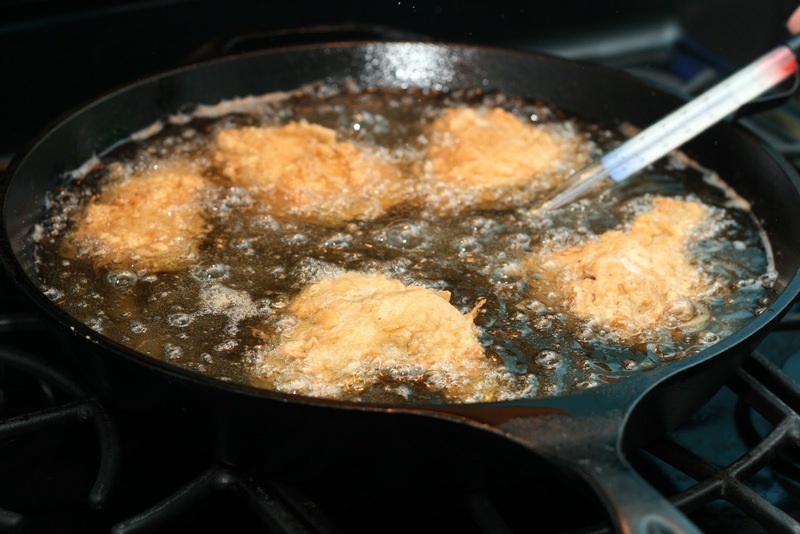 Dry the chicken in batches until golden brown. Drain on paper towel lined plates. Whisk together the dry ingredients in a large bowl. In a small bowl, whisk together the wet ingredients. Add the wet ingredients to the dry and stir to combine. Follow the instructions included with your waffle iron to complete the waffles. For most large, Belgian-style waffle irons you would use 1 cup of batter for each waffle. I love my waffle maker. You can keep the waffles warm in a 200 degree oven until ready to serve if needed. Continuing this year's theme of the 1930s with chicken and waffles. 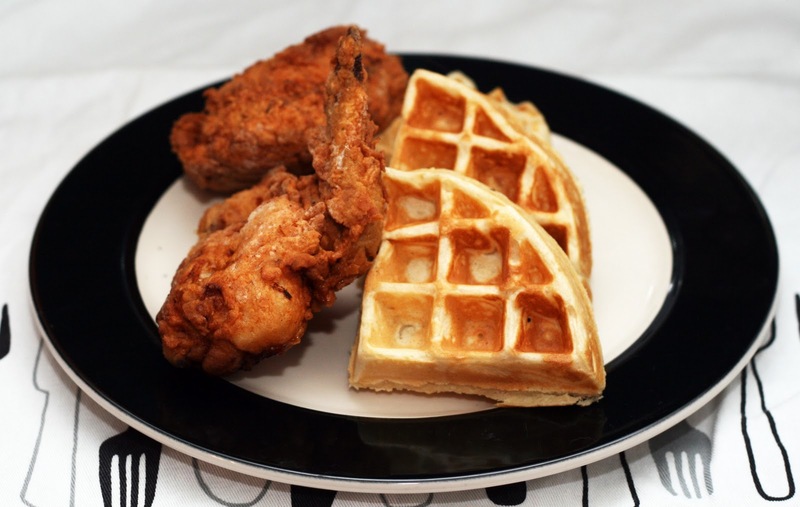 While chicken and waffles certainly were not entirely new inventions of the 1930s, the popularity of them soared when Wells Restaurant in Harlem opened in 1938. It really is a fun combination. The Wells Restaurant served the waffles with a variety of syrups (rum, mint, spiced, clove-maple, orange and raspberry)but I served mine with the delicious hickory syrup I bought at the apple butter festival in West Virgina. Stir together the dressing ingredients. Spread on 4 slices of bread. 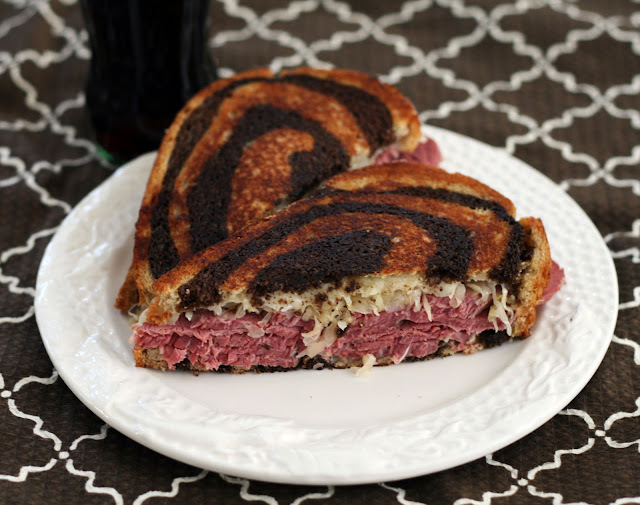 Top each with a layer of corned beef then sauerkraut then Swiss. Top with the remaining slices of bread. Melt the butter in a skillet and cook each side until golden brown, covering briefly if needed to warm the sandwich through. Slice and serve. I included this on the menu of our 1930s extravaganza despite the sandwiches origins being in some bit of dispute. However, the first verified mention of a Reuben sandwich on a menu dates from 1937 so that is good enough for me! I like homemade ones (and the variation of using the rye/pumpernickel swirl bread) much better then too greasy ones one often encounters at a deli or sandwich shop. Taking a moment to warm the sauerkraut or let it come to room temperature helps the sandwich heat all the way through. 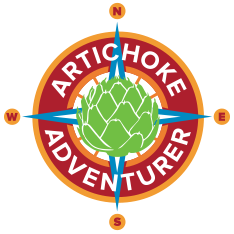 Place all ingredients from group #1 in a 4 quart slow cooker and cook for 8 hours*. Add some masa if the chili needs thickening. Preheat oven to 350. Cover the bottom of a 9x13 inch casserole with a single layer of Fritos. Top with chili. Sprinkle with onion, then cheddar. Arrange additional Fritos around the edge of the pan. Bake for 15 minutes or until the cheese is melted. *If you'd rather use the stove top, saute the vegetables and chiles until soft. Add the meat, cook thoroughly. Add remaining ingredients and simmer 1 hour. Note: This serves a lot of people. One can halve the recipe and bake it in a 8x8 inch pan instead. Fritos date back to 1932 and Frito pie is said to have followed not long afterward, making it the perfect addition to our 1930s meal. There really isn't a definitive recipe so I created this one with a slightly spicy chili. 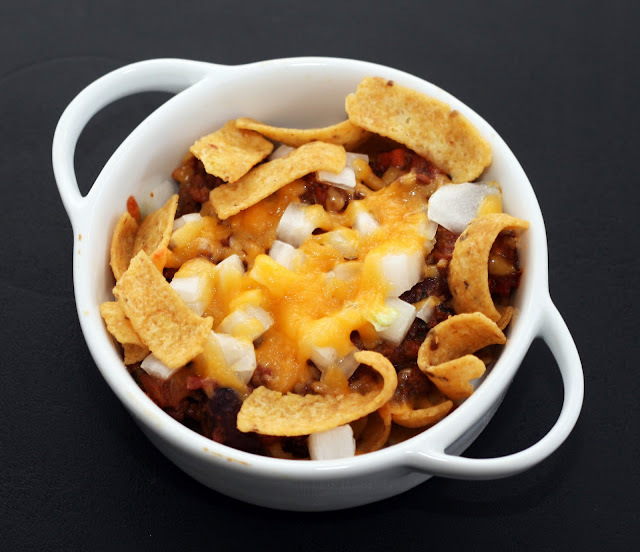 This is the classic version of Frito Pie, for a "walk-around" version, skip the baking and serve the chili directly in individual sized bags of Fritos and top with onion and cheese. In a small pan, mix flour with milk and boil until thick. Cool. Beat until fluffy and add other ingredients one at a time, beating well after each addition. Refrigerate 1 hour. The cream should be cold and rather stiff when you pipe it into the cake, the act of piping will soften it to the correct consistency. Preheat oven to 350. Thoroughly grease 8 to 12 wells in a "cream canoe" pan. Whisk together flour and baking powder in a bowl. Set aside. Stir the vanilla into the milk. Set aside. Cream the butter and sugar in a large bowl until fluffy. Beat in eggs one at a time, until it is very light and fluffy. Add flour mixture alternately with the milk, beginning and ending with the flour mixture, thoroughly incorporating each addition before adding the next. Pour into prepared pans. Note: check the instructions on your pan, but I would recommend filling them about halfway, there is a lot of leavening in the the batter. Bake for 15 minutes, or until the cakes are just golden and a toothpick inserted in the center of the center cupcake comes out clean. Remove from the oven, invert to a wire rack and cool completely before filling. Use a pastry bag or cream filling gun (one comes with the pan I linked to) and fill three holes on the underside of the cake with cream. Slightly overfill each hole, then use your thumb to tamp it in. We planned a lot of food for our themed night(s) (since NYE was on a weekend this year, we extended the food into the next day)and when I saw that Twinkies were invented in 1930, I knew I had to make them! 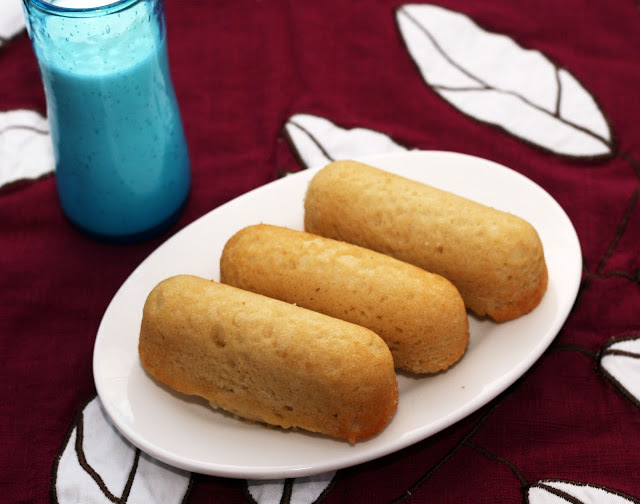 I've made other homemade Hostess cakes before but never just plain Twinkies. The original Twinkies were banana flavored so that it what appears here but if you prefer to make more "modern" Twinkies, use vanilla extract instead of banana. They were like the best Twinkies you would imagine: fluffy, not too sweet and with a wonderful creamy center. And fresh tasting! It seems a bit fiddly to make but honestly, they were no more difficult than making regular cupcakes. Place all of the salad dressing ingredients in a dressing shaker or lidded jar. Shake until well combined. Refrigerate until ready to use. Place the lettuces and most of the watercress in a large bowl. Toss gently. 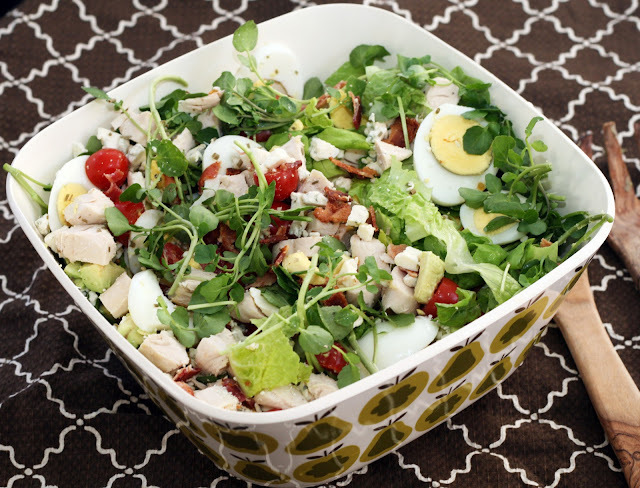 Arrange the tomatoes, bacon, chicken, eggs, and avocado on top of the lettuces. Sprinkle with the remaining watercress, chives and cheese. Sprinkle with dressing. Note: I made the bacon, boiled eggs and poached the chicken the night before I made the salad. As we do every New Year's Eve, my husband and I had our decade themed night. We started at the '80s and have worked all way down to the '30s. The Cobb Salad was invented at the Brown Derby in 1937** and was very popular with the people of Hollywood. I've tweaked the original a bit to reflect what is available now (I used cherry tomatoes instead of peeled regular tomatoes, left out the chicory) and modernized the dressing a bit. The spirit is the same, however! I found it to be a good salad for winter actually, because it didn't require a lot of out-of-season ingredients and it was quite hardy. *I poached it in water and vermouth with some pepper, garlic cloves and a few bay leaves. **The story goes that Mr. Cobb, the owner of the Brown Derby made this salad late one night out of whatever odds and ends he found in the kitchen. His dining companion, Sid Grauman of Grauman's Chinese Theatre fame, liked it so much he ordered it again and it was added to the menu.